In the mood for a road trip or a weekend away? Felt like you didn’t go anywhere this summer? Have frequent flyer miles to burn? Planning to recharge the tan? DCGreeks.com presents its 2005-2006 Fall/Early Winter Greek-American Travel Guide whether you’re looking for a day trip in August, a weekend down south or out west in September, an excuse to visit the Nation’s Capital (if you’re not from DC) in November, or five days in the Caribbean to start off next year right. As we’ve highlighted on this site before if you’re willing to drive a couple of hours from DC on a weekend in August, you can get a head start on Greek festival season in the mid-Atlantic region. The Dormition of the Virgin Mary in Winchester, Virginia and the Neohorites Festival in Pennsylvania offer back-to-back weekends of relaxed festival fun in unique outdoor atmospheres, which are worth it just for the drives through small towns themselves. Both of these festivals were well attended by young adults last year despite many Greek-Americans being in Greece for the Olympics. Memorial Day Weekend typically is the last big beach weekend of the year, but for those of you looking to spend time inland, the YAL and AHEPA of Atlanta, GA are hosting their 2nd annual YAL/AHEPA Labor Day Weekend festivities. There will be an AHEPA Golf Tournament on Friday, September 2, AHEPA Softball Tournament September 4th and 5th, with a YAL/AHEPA Dance Saturday and a Greek Night event Sunday. Hotel accommodations are $79 a night with Marriott Century Center of Atlanta. Closer to home, but sticking in the southeast, we’ve gotten word from a couple of young adults with ties to the DC area that the church in Raleigh, N.C. is having its Greek Festival on the weekend of September 16th - 18th at the NC State Fairgrounds. In conjunction with the festival, these young adults are attempting to host what according to them will be Raleigh’s first-ever Greek Night on Saturday, September 17th. For those of you who have never been to Raleigh, it’s about a one-hour flight from DC or a 4 ½ hour drive. Taking a quick peek at the calendar, we also discovered that NC State, North Carolina, Duke and Wake Forest, all have home games that weekend, so if you’re into mixing good old fashioned Southern college football with a Greek Festival and a Greek Night, a trip to Raleigh for the weekend might be the way to go. If there was ever an event that on paper looked like a winner, it has to be the 2nd Annual Opa Las Vegas & Greek Festival Trip on September 22-26. Start with the fact that it’s in Las Vegas so even if it was the worst Greek event ever, you’re still in Vegas in September when the temperatures are still in the 90s. The $139 a room group rate for the hotel is phenomenal considering that those rooms normally run close to $300 on the weekends. (The early word is that the rate may have sold out, but check with the hotel, or other hotels in the area to see if there are any other special rates.) The scheduling, or lack thereof, may even put Clearwater to shame. What other itinerary encourages you to wake up at noon and hit an all you can eat buffet and then visit a Greek festival in the evening? (This event is so a la carte it doesn’t even have a registration fee.) Having been to the church out there, it’s a work of art that is maintained by a vibrant Greek community just a few miles off the Strip. 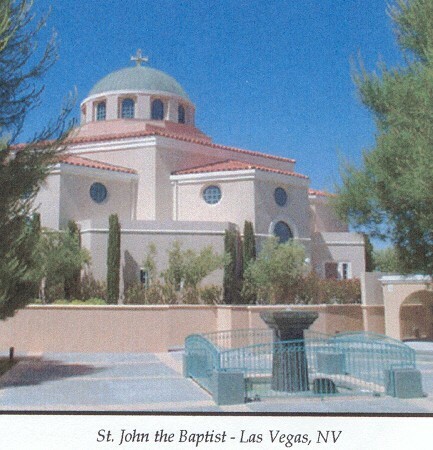 (Two of the churches in the DC area are planning to have work done by the same architect; if the end results are even half of what the church in Vegas looks like, it should be welcome additions to the area.) For those of you looking for any excuse to go to Vegas for your first time or your fifteenth time, categorizing this as a Greek trip may be all you need to visit Sin City. Join us in November for YAL DC Weekend 2005. YAL DC Weekend has established itself as the event of November moving to a weekend earlier this year. (It was only a few years ago when the event used to be held in mid to late October.) This year’s event promises to be bigger and better and registrations have already started to filter in from out-of-towners who have heard of the fantastic job that the YALs in the DC and Baltimore areas have done over the years. Details had been a little up-in-the-air to this point, but it looks like Home Nightclub near the MCI Center will be the venue for all the Greek Nights with the semi-formal dance to be held at the Mariott Metro Center. As a twist to the typical sight-seeing tour, we here at DCGreeks.com are going to sponsor a photo-scavenger hunt/race around DC on Saturday afternoon as a self-guided, semi-competitive way to get to know our Nation’s Capital as quickly as possible. With all the buzz that’s been circulating about this event at Clearwater and elsewhere, upwards of 500 registrants are expected. The YAL DC Weekend is offering a drawing for a free registration for attendees who register before August 31, 2005. Registration forms can be found here. This year’s version of “The Greatest Greek Party on Water! !”, leaves Miami on Friday, January 13th for three nights with stops in Cococay and Nassau in the Bahamas returning on Monday, January 16th. For those of you who have a couple of more vacation days to use, there are two days of pre-partying in South Beach on Wednesday and Thursday. The trip features two private Greek parties on the boat featuring DJs CnD and a formal dinner. (The first of these parties will be open bar.) Those who have been on this cruise over the past eight years say that it’s a change of pace to the typical conference as the smaller numbers of participants give people a chance to meet and know each other over the course of the three day weekend. Prices for this cruise start at a mere $259 per person, but end on 9/28/05. Those wishing to attend this cruise can find reservation forms and a full itinerary here.